Have to stay in a RV park for two months, definitely not my favorite thing, but as you can see, for an RV park, it is not all that bad. When I got here at the end of March, the dirt roads out on public lands were under snow and now they are WAY too muddy. Am definitely chompin’ to get out and dry camp. Doesn’t look like I’ll be doing any of it until after my primitive campground host job ends at the end of September. If you use Google Earth, type in latitude: 40°58'54.29"N and longitude: 111°48'23.08"W. Will be nice therebut it’s not the boonies. 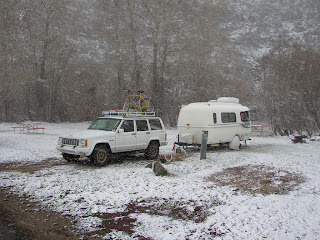 Once the snow melted in the RV park, I moved to this site along the edge by a wooded section. Aren’t any other rigs in this corner so I let Meadow and Onyx out a couple times a day. They were sure ready after a month of walks on a leash. This site also has access to plenty of deadfall. Any night it isn’t too cold has me sitting out by a small campfire. I get in some decent hiking a few days a week over in Midway. Not far from where I’m set up. Been a long time since I’ve seen so many elk, moose, and wild turkeys. Could have used snowshoes for the first four weeks and then there was the mud. Ah yes, springtime in the mountains. My silversmith classes at the Kimball Art Center were fun and each student worked on a silver pendant with a bezel setting. I’d like to teach another class in October but I need to find some public land within a half hour or so of Park City where I can disperse camp. There’s no way I’m going back to a RV park. Does not look promising with all the expansion in the county. Guano. 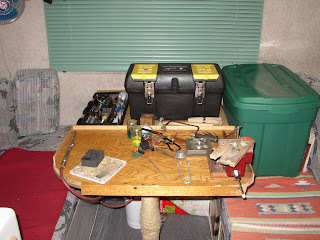 Have had to do most of my bench work inside with the weather as it is. A little cramped. Oh well, not all that much longer. Taking advantage of wi-fi and getting loads of work done on the MacBook since I’ll only have web access one day a week during the summer. Two more weeks here so I’m focusing on getting back into trail running. The first month here, I carried a 25 lb pack while hiking just to work muscles, heart, and lungs. My runs are now up to a bit over an hour. Slow, but at least I’m finally getting serious about it again. Still shooting for running another ultra. Had an interesting run the other morning when a lens fell out of my sunglasses. Never tripped so much during one run before. Don’t know if I am going to survive getting back into trail running, however. On one fall, as I was slammed down to the ground, a stick cut the side of my neck. Three inches to the right…. Another fall had me tumbling down a hill, off the side of the trail. Must have gone a good 20’. I felt like moaning but I was lying there looking up at the sky and started to chuckle. It’s as if the gods are saying, “Well, like what do you expect!” Except for a few token weeks here and there, I’ve been away from trail running for years so I guess I have some adjustment to do. Not bad for one getting close to sixty, though. On yesterday’s run I was thinking that I’ve only been seeing mule deer lately. The elk and moose have moved farther up the mountain. It wasn’t five minutes later when a moose cuts across the trail not more that 50 yards in front of me. What’s this!? Is one of the gods listening to my thoughts!? Maybe I should ask for a winning lottery number on my next run. I’ve been seeing two sandhill cranes when I’m up in the hills, now that the snow is gone. I wonder if they come over for the new growth among the sage or just for the field mice. Saw the first hummingbird of the year yesterday so I went into town and picked up a bag of sugar. A hummingbird found the feeder in about two hours. This one was quite colorful. It’s a treat having two bird feeders hanging off the back of the camper and watching birds from five feet away. We were in for the evening one night and a skunk goes walking by outside. Meadow and Onyx dart to a window to check out this new creature. Sure hope they don’t go looking for him when they go out in the morning. There are two osprey nests not far from the park. All in all, not too bad. I have learned to be content with whatever I have.